For professional photographers and amateurs that aspire to become great, a light meter is an invaluable tool that will help you achieve that perfect shot. Unlike the built in light meter in your camera, an additional light meter will give you an accurate reading of the light bouncing off your subject (reflective), the light falling on your subject (incidental), and the light your camera flash is generating. Aside from photography, light meters are used to measure proper lighting for plants or to cut down on electricity waste in your home or office. Electricians can benefit from owning an appropriate meter for their profession, it should be one of the first things you pack in your tool box. When it comes to light meters, the Sekonic name is undoubtedly the industry standard in metering technology for photography and film. 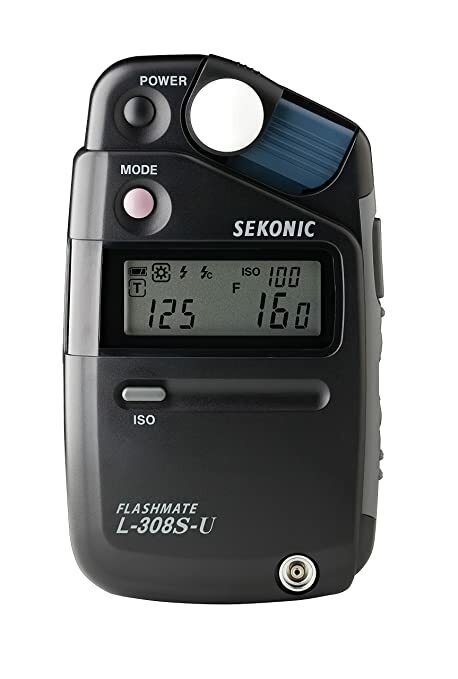 The new L-308S-U is an extremely compact yet powerful digital meter, in fact it is the smallest flash-meter Sekonic offers with the same great ability to read the lighting conditions. This product retails on Amazon Prime for $199. It doesn’t take a degree in photography to use a light meter, and your work might improve markedly if you invest in one of these tools. By measuring the incident light that falls upon your subject and the reflective light your subject gives off, you’ll have an accurate idea of how to adjust your camera’s flash settings. Unlike an internal camera light meter, this Sekonic will be infinitely more accurate. Its assistance will allow you to shoot exposures that are within a tenth of an f-stop. In case you are unclear on what the f-stop is, it describes the ratio of the camera lens’ focal length to the diameter of the entrance pupil. In layman’s terms, the f-stop controls how much light you let into your camera lens. The higher the f-stop reading is, the less light you allow into your camera. So in a very dark shooting location, you would want to have a low f-stop to allow in as much light as possible if you wanted a lot of detail in your shot. Because this meter reads the f-stops to a tenth of a stop, you will need to adjust the settings on your camera accordingly. The display will show the f-number plus up to a tenth of a stop. It’s important to keep this in mind since on your camera only whole f-stops will be shown. The 308s-U for photo meter is designed to be easily packable and able to fit in your pocket. It’s dimensions are 2.5 inches wide by 0.9 inches in diameter. With a weight of only 3.4 ounces or 95 grams, you will barely notice you are carrying it. Sekonic’s small meter is as powerful as it is tiny, giving the photographer an accurate exposure reading in ambient or flash situations with exposure readings in full, half or even third-stop increments. These settings are a perfect compliment to industry cameras. Readings for reflected light capture a wider field of view than a normal lens at a 40-degree angle. The meter varies in its readings of flat-field incident lighting and normal incident lighting thanks to a built in Lumisphere that is activated when sliding over a silicon diode sensor. When in a flat-field scenario the Luminism will cover the sensor to measure contrast and exposure within a scene that might feature flat artwork. For electronic flash exposures, the photographer has the option of using the meter with or without a PC cord. All the exposure and data information is displayed on Sekonic’s intuitively designed LCD screen. They borrowed from the screen’s look and feel from the larger professional model L-358 and made a small version that compliments this smaller model perfectly. All data is shown in large easy to read type and informational icons. Included with this light meter is the Luminism, a soft carrying case, strap for easy use while the meter is around your neck, a AA battery, and a synchro terminal cap. This affordable meter is Sekonic’s small product for still photography. The small counterpart for cinematography is the 308DC-U. At nearly $100 dollars more, that model is still a fantastic deal if you are looking for an affordable meter for measuring exposure while shooting photography in motion. It’s small size and super accurate readings make this a clear winner in our best light meter category, but it is important to consider that it is designed for photographers specifically. Sekonic does not disappoint with their quality, and their pride in their products also inspired them to give this meter a one year limited warranty. Customers can choose to register and then receive an extra two years on top of that one year warranty. It’s always advisable to extend a warranty if you have that option. For such a low cost and easy to use and stow product, the Sekonic L-308S is a great purchase. The Dr. 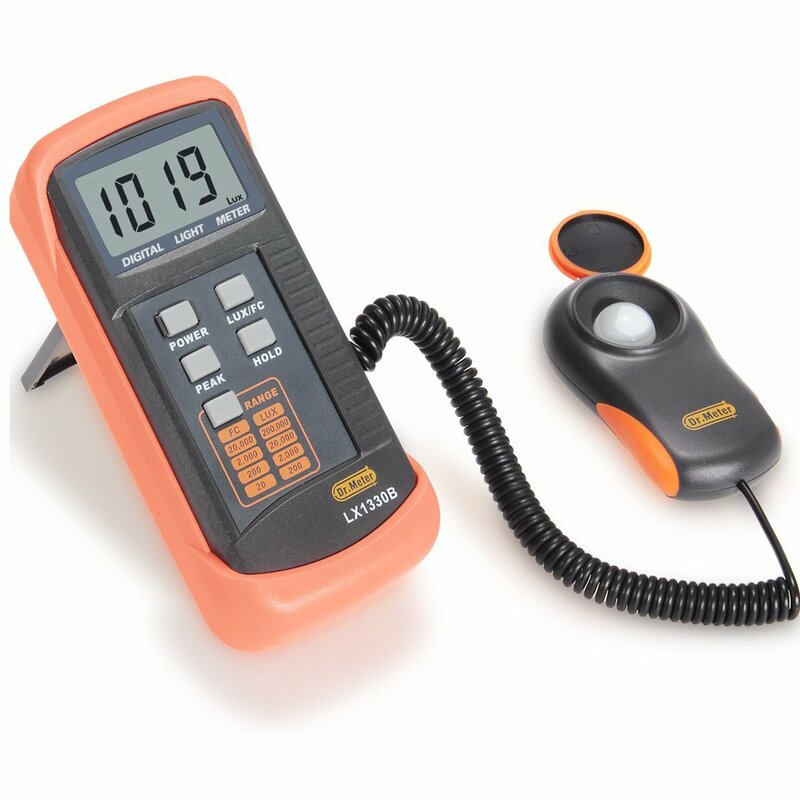 Meter Digital Illuminance Light Meter is a convenient and accessibly priced meter. Unlike the Sekonic which is a meter specifically designed for photographers, this Dr. Meter product can be used for that purpose or for measuring interior light for general aesthetic or gardening purposes. It is not going to be as precise as you might require for your professional photography or cinematography purposes, but it is a good functioning light meter that serves it’s purposes. Normally retailing at around $70, on Amazon Prime the price has dropped to as low as $39.99, a nearly 50% price break. An aspiring photographer might find this meter to be a good starting point since the cost is so low. But it is important to realize that it is probably not what Dr. Meter intended as the meter’s primary purpose. It would probably be a better fit for a scenic designer or interior designer because the accuracy is not up par for your photographic needs. That being said, if you need to occasionally measure light for a photograph while also designing an interior setup this might be a good purchase. You won’t be using it to measure your correct f-stop setting but it will give you the amount of light in candle powers and a general sense of how much light is present in a room. In a pinch it might be more effective than your camera’s internal light meter but in general you won’t find much support for your photography hobby if you purchase this. As an electrician, this meter might be your best choice. Part of your work necessitates you to know the correct amount of light in certain parts of a building. This might be particularly important in an older building or in a situation where you want to make sure the fuses are not overloaded. The Dr. 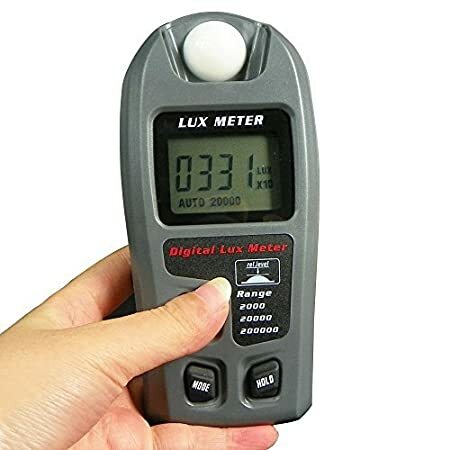 Meter Digital Illuminance Light Meter is a convenient and packable size and weight. At only twelve ounces, this little tool is light to carry and comes complete with a carrying case and nine volt battery. It’s dimensions are 2.75 inches by 1.5 by 6 inches. You’ll also get a user manual with your purchase which will help you utilize the full potential of this product. Some common uses for this lighting meter include testing how effective different light fixtures are in the same space of your home. You can test exactly what wattage is truly necessary to have and how the different wall colors and surrounding objects to your lights affect how much light you are receiving in that space. This type of comparison might not seem important but in a work scenario the amount of wattage can help immensely. For the gardener or designer that depends on the health of their plants inside, this tool can save a lot of time. Your plants are dependent on the right amount light and their location inside your space is of the utmost importance. Some plants will thrive by your bright open windows and some require just a slightly lesser amount of light. If you are setting up a model home or a sample office space and won’t be visiting for a few days, you might be surprised to see how quickly the wrong amount of light can negatively affect the image your are trying to present for clients. This meter has unfortunately not got a huge amount of storage, which would seem to be an intuitive design choice particularly for those testing lighting scenarios in a variety of locations. Despite this oversight, it is a very decent and extremely cost effective little device. At such a low price, it seems like a no brainer for a variety of professionals to purchase Dr. Meter Illuminance meter. The Extech LT40 light meter is another fantastic choice for professionals that need to measure and adjust to the light in an indoor building situation. This meter measures Standard and LED light. Unlike the Extech LT45 which measures color and white LED light, this more basic model measures just white light. Discounted through Amazon Prime, the cost is only $102.46, though it may retail for as much as $120 normally and at other retailers. This meter has a nice professional appearance and comes in a dark green color. The buttons are clearly marked and the screen is a good size for easy reading of information. In addition to reading and measuring white LED light, this unit can also measure fluorescent, metal halide, sodium, high-pressure and incandescent light sources. The Extech sensor is at the top of the meter and is protected when not in use by a protective cover and an additional storage pouch. It will be safe in your pocket or in your tool kit. The unit is powered by two AAA batteries, the first of which are included with purchase as well. Extech was sensible in including an auto power off feature in case you accidentally leave it on between use. This small light meter is an extremely compact and convenient choice. It has no extraneous pieces and the entire unit weighs only 10.4 ounces, just over half a pound. It’s dimensions are 5.3 inches by 1.9 by 0.2 inches. Extech guarantees that you will be pleased with this product and includes in your purchase a one year warranty. Make sure to contact customer service to insure that your warranty is in place before you begin frequent use. In the United States OSHA, or the occupational safety and health administration, regulates the lighting inside public workplaces to make sure illumination is bright enough for certain tasks. Proper illumination is required for buildings to comply to certain safety codes. In addition to electricians, many other occupations may benefit from purchasing a light meter with the capabilities that the Extech offers. Those performing site surveys will find this to be a very good fit for their needs. To measure light in the same space over a period of time, the Extech meter comes with a tripod mount that allows you to keep the unit stationary over whatever span of time you need to observe the light in. One complaint that some users have reported is that this meter is not particularly effective in very low light situations. The screen is not back-lit which makes the display very difficult to read at night. Calibrating the meter to this low light situations may be difficult which is something to consider if you plan on using it frequently at night or in very low-light situations. For a very reasonable cost and because of it’s streamlined and small exterior, this Extech monitor is a great choice for a variety of applications, though photography is not one of them. Our best budget pick in the light meter category goes to the Leaton Digital Luxmeter. At the super low cost of $19.99, this budget meter is another that is useful for measuring the light in a room but is not delicate enough to help much with photography. The Leaton meter is exceptionally lightweight at 4.8 ounces. That is less than half a pound! It’s dimensions are 6 by 3.4 by 1.6 inches and it operates with a nine volt battery which is not included. It also works in a wide range of temperatures, operating in environments from 14 to 122 degrees Fahrenheit and has an automatic power off function after 15 minutes without active use. This little meter is fairly specific and measuring light in either Lux or Fc units and can record a measurement twice a second. Choose to record either an automatic range of space in your environment or select your own manual range. The accuracy of the readings is plus or minus 4% of the light you are recording. Other great features of this Leaton luminance meter include it’s large LCD character display. It is clear and easy to read, though it does not include a backlight function which would make the product more functional. This item doesn’t boast the bells and whistles, it is a pretty utilitarian option but it does the job. In terms of industrial and electrical work, this is a very affordable selection. The hold button is a useful addition to the basic design, allowing you to lock your last reading. Though this isn’t as useful as a meter that would store several readings, it allows you time to jot down your measurement before moving onto the next location. Customers buy this product for gardening purposes rave about the improved results they get with their indoor plants after use. For a practical selection that will work for a variety of purposes, the Leaton Digital Luxmeter is the best budget option available in this category. What application do you want to use your light meter for? Most people are unaware of the multitude of uses a good light meter has. Most commonly known for their assistance to photographers, light meters are also an essential tool for electricians, industrial engineers, interior designers, and gardeners. Pinpointing your intended use will help you to determine which one of these great light meters is ideal for your needs. For photography, it’s important to go with a trusted name that will provide you extreme accuracy in a variety of different lighting environments. If you are a working electrician, having a unit that stores your readings will expedite your workload and make determining what areas need improvement effortless. How many times per day will you use your light meter? If you plan on using your meter frequently throughout the day and often travel between several different locations, selecting one with an auto off function is definitely advisable. None of these units have rechargeable batteries, making it essential that you save your power for when you need it. If you plan on transporting your meter from site to site then size should also be your key consideration. While most of these products come with carrying cases, choose one that can fit around your neck or in your pocket so it is always close at hand. Is your light meter a deductible expense? If you are self employed and paid for your work that involves your light meter, the answer is yes. If that is the case, do not consider investing in anything except a top of the line meter that will serve you for years to come. Meters that have warranties are highly recommended, they are an indication of the company’s confidence in their product and reflect your own professionalism. Be sure to record your sales receipt and report your purchase to your accountant or keep a copy for yourself if you handle your own taxes. How accurate do you need your light meter’s readings to be? As with many items, the amount you invest will significantly increase the accuracy of the product you purchase. As a photographer, it is essential to be able to take an extremely accurate reading of the incident light falling upon your shot and the reflective light that your subject gives off. Do not attempt to make this readings with a meter designed for industrial or gardening use. Some plants are also extremely temperamental to interior lighting environments, and it’s very important if you are growing plants as an investment to invest in a meter that will give you an accurate reading. Things can go downhill quickly if plants are exposed to too much light or suffering without enough. Don’t trust your eyes to determine what level is perfect. With the myriad of uses for light meters come a plethora of options to choose from. What stands out across the boards is that using a light meter will give you better and more accurate results in whatever you field of work may be. They may be the defining line that illustrates your professionalism and expertise and separates you from your competition. The naked eye can be misleading and when it comes to making a call on what kind of additional light you might need, or the safety of a pre-existing light setup, it is impossible to overestimate how useful a light meter can be.